Getting explicit user consent with gathering analytics data in an app, or with processing the user’s personal data, is an important part of establishing user trust and seamless user experience. It is also an obligation of an app developer stated in App Store Guidelines (2.5.14 and 5.1.2), necessary to fulfil to get your app approved for distribution. Per the guidelines, if an app uses a 3rd party tool for analytics, it is the sole responsibility of the app developer, not of the 3rd party tool provider, to verify that the analytics tool does not register events in the app without user explicit consent. Although implementing a simple dialog to obtain user consents and store them for further reference seems like a straightforward process — digging into it reveals (as it is usual with “simple tasks”) that many programming and design details should be respected. Since implementing the consent goes beyond core functionality and the intended design of the app, it is likely that this consent necessity will bring further annoyances, impact time and disrupt existing developing processes. So why not use or reuse some ready-made SDK? SmartlookConsentSDK works well with both Swift and Objective-C apps. Discuss the ConsentSDK directly on Smartlook Discord server. This method first checks if the user already provided/rejected consent for both privacy and analytics. If not, the privacy control panel is shown with build-in defaults (consent is provided for both). When user agrees, the callback is called to let you handle the user preferences. In the case user previously went though these settings, the control panel is not show and the callback is called straight away. In this example, only consent for analytics is sought for with the consent provided by default. Add cocoapod SmartlookConsentSDK into your Podfile. Generally, you want SmartlookConsentSDK.check() be called at the very beginning of the app life-cycle. Where exactly, it depends on your app architecture. If you don’t want integrate this SDK into the standard app Settings, then viewDidLoad() of the root view controller is enough. If you want more comprehensive solution, then see our demo apps AppDelegate and ViewController for an inpiration. The SDK is fully compatible with Objective-C. For code examples see the respective demo app. Consent is identified by a string constant. For convenience, SDK provides a String alias with two predefined constants, .privacy a .analytics together with the respective text placeholders in demo app Localizable.strings. However, any string works, and the name convention used in Localizable.strings is obvious. Is a standard enumaration and indicates whether user seen and provided consent to a policy. a straigth one w/out consents configuration that can be used when both .privacy and .analytics policies consents are required with .provided as the default value. Two variants much like check(), it always opens the Control Panel for the user to review their current privacy settings. Whenever user closes the panel opened by a call to check() or show(), SmartlookConsentSDK.consentsTouchedNotification notification is broadcased (regardless whether the consents were changed or not). This provides an alternative way to the callback block to let the app know there might be a change in consents. In ObjC, the notification identifier is SLCConsentsTouchedNotification. The texts shown in the control panel are configured using the standard Localizable.strings mechanism. Localizable.strings are also used to provide an optional URL of a detailed policy information (thus the link is localised as well). The keys used in the Localizable.strings are listed in the table below, or you can simply reuse the file in our demo app . where *consent-key* is simply the text string constant used to identify the policy. 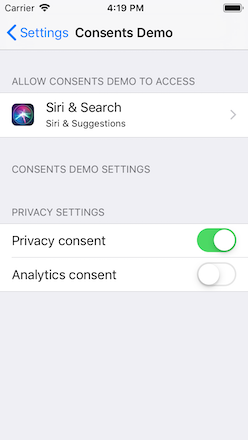 The Consents SDK can be straigthforwardly integrated into the iOS Settings app so the user can also review their consents there. To do this, some manual work is needed even if the SDK is integrated using Cocoapods. If you are not familiar with adding system settings panel into your app, have a look at Implementing an iOS Settings Bundle or just copy the Settings.bundle from one of our Demo apps to start. Into it, add a Toggle Switch for each consent.